The Inlet of Srager can be dangerous, if your pilot isn’t from here. The waters are not clear, there are unmarked shallows and shoals, these were never cleared so as to discourage pirate attacks. Rumor has it that someone on this island can cause the shallows to rise up and form a barrier across the Inlet. 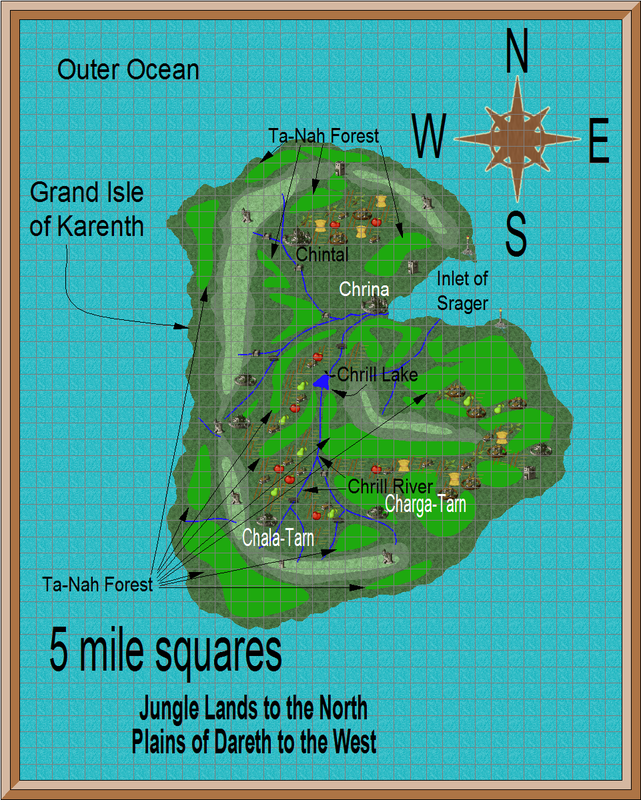 All of the forested areas are part of Tah-Nah Forest. Chrill Lake holds fresh water fish and is used to train young sailors in the art of fishing and cleaning fish. In the local version of Common, Tarn means town and Taga means City. But since there is only the one city, it can also mean Capital. Or it could mean ‘look at us !’. the half-elves are good at fly fishing. they are also the rangers in the area. the wood elves are good at fly fishing. very few adventurers here, about 5 per year. If someone decides to go off adventuring, they get a bit of training, and they leave and go to either Trillolara or Dank Forest. They also receive a bit of a class so they don’t act too stupid in a city. Few come back from Dank Forest, so the trend for the past 50 game-years has been to travel to Trillolara. Most feel that being in the fishing fleet is enough of an adventure. Updated map: Jan 10, 2015 to show Charga-Tarn and Chala-Tarn.